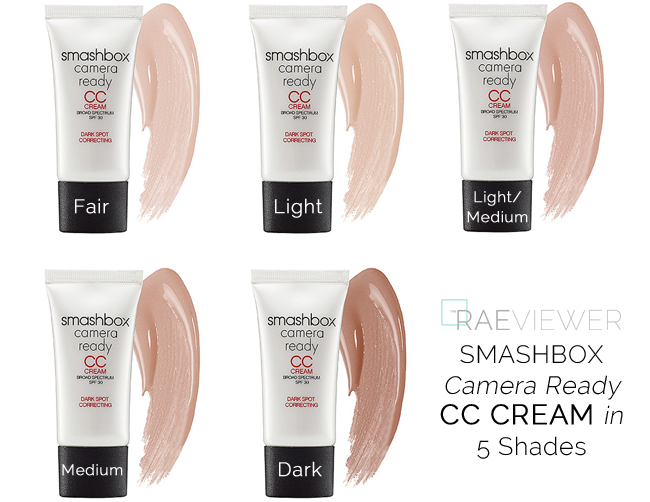 Smashbox recently released the Camera Ready CC Cream, $42 USD, and it is by far the best base makeup product from the brand that I have ever used. I generally prefer Smashbox's powder makeup to the liquid and cream foundations because I have experienced major oxidation issues in the past. This CC Cream, however, is top notch. I love how easily and smoothly it blends and how lightweight it feels on the skin. It does oxidize, but only by half a shade darker (if that). The SPF 30 is ideal for use during the day, especially if you are in a rush or tend to avoid sunscreen because of the greasiness. The formula is just moisturizing enough for my normal skin and keeps my T-zone free of shine. Those with very oily skin may have to blot mid-day, but this CC Cream is much better than any BB cream I have tried in terms of lasting power and oil control. Redness and pores are much less noticeable with the product on, but most importantly, it does not cake up. Do keep in mind if you have any dry patches, though, that this CC Cream will accentuate them. Setting the Smashbox CC Cream is not a required step on normal skin like mine, since it is very natural in finish (never too matte or too dewy), but I had to manipulate the final color of the base makeup with the darker Halo powder because the CC Cream in Fair is obviously too pale on me. You can wear this CC Cream alone or with liquid foundation on top, but I wanted to to stay true to how I would actually wear this product in my day to day life. The video demonstrates how pale the Fair shade is on my light to medium yellow-toned skin, but it is also intended to show that life isn't over just because you purchased the wrong base makeup color! I enjoy the texture and wear of the Smashbox CC Cream enough to purchase my proper shade match, so I will update you in the upcoming weeks with how it looks on its own without powder to correct it. The Smashbox CC Cream is more affordable than the Chanel's, which is $55. Both are lightweight and can be layered, but the Chanel CC has a higher silicone content. I reviewed the Chanel CC Cream HERE if you are interested in learning more about my favorite, but the Smashbox is slightly different in that its primary skin care claim is to reduce dark spots. As I stated in the video below, I have not used this consistently enough to determine how effectively the Smashbox CC Cream works on this level but others have seen results. Bottom Line: Though Chanel's yellow-toned CC Cream is a better color match for the undertones of my complexion, I find that the wider shade range and more affordable price tag of the Smashbox Camera Ready CC Cream give it a leg up on the competition. Now watch the Smashbox CC Cream in action here! -- Again, I should use Light or Light/Medium but I only had Fair to show, sorry! Nice post. I actually use a bb cream (waiting to finish it before I go to a cc cream) and I put it on before I went to the beach last weekend and everything except my face got seriously burnt. I have to find a natural sunscreen for my body next time. My bb cream is great but it kind of leaves my face a little oily and I don't like that. I will definitely have to try the smashbox cc cream. Thanks so much for sharing.